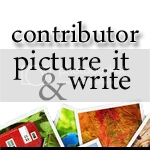 Picture it & Write is a weekly creative writing prompt hosted by the Ermilia coauthors, Ermisenda and Eliabeth. We invite you to join in; continue the story or starting your own based on inspiration from the image. Poetry and foreign languages are welcome, but please provide a translation. This photograph will be reblogged under Ermisenda on tumblr and added to the Picture it & Write gallery on Facebook and Pinterest. Mummification had com a long way, but it still had a ways to go. The ugly grey cloth the barbarians used to wrap their dead had been replaced by a smooth goo that preserved the body indefinitely. The only problem was the smell. Oh how I missed the stench of formaldehyde, a bouquet of flowers compared to what this new process smelled like. Many couldn’t handle it, but I fought through the burn of acid in the back of my throat as I resisted throwing up. From the outside looking in, this new process was beautiful, capturing every curve, every crevasse of the human body. The soft chirp of the keys caused the boor to buzz open as I arrived at work. I opened my office, expecting it to be empty. Everything I was carrying slipped out of my hands when I saw it. Her. The pain of the books hitting my foot was nothing compared to the pain in my heart. The shape of her face, the ear piercings. The mummified girl was my sister, and she had clearly not been dead when they embalmed her. 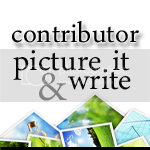 Show pride for being a Picture it & Write contributor by displaying the button on your blog. Please link back to the Picture it & Write category or Ermiliablog! Lovely poem, I like the victorious tone that mine clearly lacked. I enjoyed the sci-fi spin as well, reminded me of Eureka and the house that controls everything. It always makes me wonder what happens if the power fails though. Very interesting, Elia. I felt trapped by the picture, and you did not. Very creative with the modern mummification material. Your sister mummified alive definitely brings out an element of horror. This one actually took me a while; I found it a few weeks ago and just stared at it, not sure where to go. I’m glad you like the writing. I don’t usually write horror and it felt a little disjointed as if I started it twice. Yay! I’m glad to know I can creep people out lol. I liked playing with my darker side. Oh that is disturbing. Were you the Jodi Picoult reader? This reminds me of one of her novels, but I can’t remember the title off the top of my head. woa your story gave me chills! creepy, creepy, creepy… and oh so beautiful. Thank you. That wasn’t where I meant to take it, but I like how it turned out. I couldn’t have said it better. Beautiful writing with a very chilling undertone. Very powerful writing and superb character voice. Tragic that this is a reflection of the world we live in. I don’t think that makes you weird, I think it means you’re a creative mind who likes to think outside of the box. It makes me think of double jeopardy, a law in the US that says you cannot be tried more than once for the same crime. If Ravenport had been found innocent of the murder, he could have unveiled the corpse in all his glory without any consequence. Gives me goosebumps! 🙂 And why not a limerick too? you can practically still see all of her! I believe you hit the nail on the head regarding what actually happened. I’ve forgotten where I read it, but 96% sure the form is created by an artist shrink-wrapping people. There were some male forms that made me blush, but this one really spoke to me as it was the only one where the subject looked like an active participant instead of a still silhouette. Yeah, I checked out the collection after I was done writing. I think you picked the right one. Short and sweet but captures the essence of the picture well. Thanks for dropping by. Thank you. It will be interesting where you take it. Welcome, I’m so glad to have another new face this week. It was also a new spin from the other contributions, sad and heartwarming without the horror element. Very well done. http://managuagunntoday.wordpress.com/2013/01/20/picture-it-write-innovation/ Voila mes chers…mine this week.. Here is mine…a little slow getting it here. Such a bitter sweet piece. At first I thought the mother had cancer, but alcoholism is just as much a disease and very rough on loved ones. de cellen van mijn huid. vervelt mijn lichaam zich bewust. my body starts peeling my skin. Oh very interesting. I got the vibe of shedding negative thoughts and perceptions when filled with love and passion. will read others soon ! Your blog wouldn’t accept my wordpress ‘credentials’; said I didn’t own the blog..!?! Poor woman, I loved the writing though. Thanks for joining Picture it & Write! I’m sorry, I thought I was caught up on replies. And, here is my contribution for this week; late as it is…! Very interesting. I don’t know what I would call it, not exactly a horror, or maybe it is. It reminded me of The Black Swan. I’m glad this week’s image inspired you. Please don’t feel like you’re cut off from writing something for an earlier week. We do our best to read and reply to all of the contributions no matter if they are months back. Oh so terribly late this week. I thought I might keep the original rolling! Hope it sits well. “There’s no way Ms. Hawthorne.” They said. That wasn’t the first time I’d heard these sorts of things. I’d called the embalming center as soon as I had collected the books from around my feet. Thoreau and Kierkegaard stared at me from their neat little pile on the desk while I waited for the operator to put me through to some sort of management there. “Bet the two of you never had problems like this.” I poked at the old copy of ‘Life Without Principle”. The yellow pages creaked ever so slightly beneath my finger tips. The conversation had only lasted twenty minutes or so. I had been put in touch with the embalming director who assured me the whole thing had been a mistake. The transport crew had confused my address with the cemetery and now… I got to see my sister one last time. The men who had brought her into my place (let in by the landlady who I will no doubt have to convince that I truly am a normal person) barely looked at me when they arrived and packed her back up to move again. As for the way she looked; still alive when the chemical bath began. Fighting until the polymer hardened and robbed her of a final breath. Struggling. Terrified. They said it was all arranged. “The embalmers need to cope somehow with the process.” They told me. Like they had some right to pose the dead for their amusement or something. Something else must be happening here. Chilling. I think this is the first time someone continued one of my prompts. I liked the end “like they had some right to pose the dead for their amusement or something. I both love and hate Frankenstein-esque stories. It annoys me that people (fictional or not) think they have the right to meddle with life because they can. However, it makes for fantastic writing when the experiment turns against the scientist. Welcome, welcome! I’m catching up on replies. I’m glad you found us.